While the IT had no trouble repeating atop the box office for a second straight frame in a row last weekend, it doesn't seem that it will be going for a three-peat, with three new movies vying for the crown in wide release, 20th Century Fox's action-packed sequel Kingsman: The Golden Circle, Warner Bros.' LEGO Movie spin-off The LEGO Ninjago Movie and Entertainment Studios' horror-thriller Friend Request. While it very well could be a close race, we're predicting that Ninjago will come out on top with $55.6 million, while Kingsman 2 will follow just behind with $52.4 million. Box Office Mojo reports that both Kingsman 2 and Ninjago will be released in roughly 3,900 theaters, with Friend Request opening in roughly 3,000 theaters. 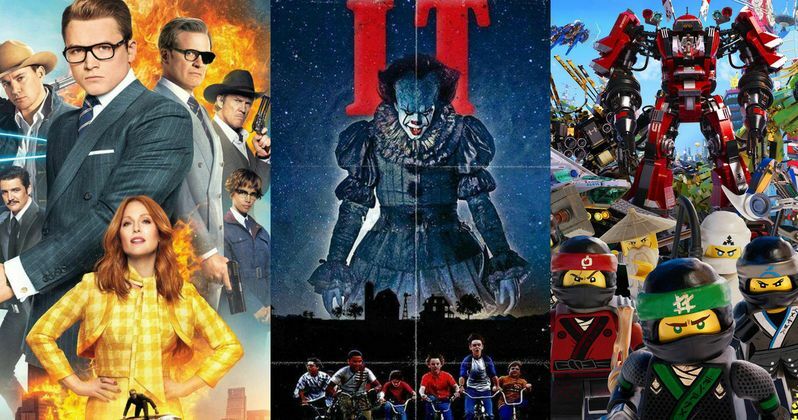 All of those movies will still fall short of the 4,138 theaters that the blockbuster IT remake was playing in last weekend, but after a record-breaking opening weekend, and a normal second-weekend drop, IT likely will drop enough this weekend to pave the way for both Kingsman 2 and Ninjago to take the top two spots, in what could be a very close race. As of now, only Kingsman: The Golden Circle has enough reviews posted for a Rotten Tomatoes rating, earning a solid 62%, although it remains to be seen how the critics will chime in on the other two movies. We're predicting that IT will drop to third place this weekend with $29.7 million, with the top 5 rounded out by Friend Request ($9.8 million) and American Assassin ($7.2 million). The opening weekend tallies for both Kingsman: The Golden Circle and The LEGO Ninjago Movie represent increases from their predecessors. The first Kingsman movie was a surprise hit, opening with $36.2 million, going up against the R-rated blockbuster Fifty Shades of Grey, en route to a $128.2 million domestic take and $414.3 million worldwide, from an $81 million budget. While the R-rated action-packed sequel will likely fare quite well, it likely won't have enough to conquer the family-friendly animated spin-off The LEGO Ninjago Movie. If the LEGO spin-off does hit its $55.6 million projection, it will have just barely exceeded the $53 million debut of this year's earlier spin-off, The LEGO Batman Movie, which went on to earn $175.7 million domestic and $311.9 million worldwide, from an $80 million budget. The top 10 will be rounded out by mother! ($4.6 million), Home Again ($3.4 million), The Hitman's Bodyguard ($1.8 million), Annabelle: Creation ($1.5 million) and Wind River ($1.2 million). Also opening in limited release is the Fox Searchlight sports drama Battle of the Sexes, Oscilloscope Pictures' documentary Bobbi Jene, Vertical Entertainment's horror movie Happy Hunting, Samuel Goldwyn Films' drama The King's Choice, Indican's action movie Ribbons, Roadside Attractions' drama Stronger, Shout! Factory's dramatic comedy The Tiger Hunter, the independent documentary Unrest, Focus Features' drama Victoria and Abdul and A24's dramatic thriller Woodshock. There is no indication yet if these films will expand nationwide or not. Looking ahead to next weekend, four more movies will close out the month in wide release, Universal Pictures' crime-thriller American Made, Sony/Screen Gems' horror remake Flatliners, Novus' thriller Till Death Do Us Part and PureFlix's A Question of Faith. Also opening in limited release next weekend is Well Go USA's Chasing the Dragon, Freestyle Releasing's Don't Sleep, FIP's Judwaa 2, Scree Media Films' Literally, Right Before Aaron, Magnolia's Lucky, Sony Pictures Classics' Mark Felt: The Man Who Brought Down the White House, Newcity's Signature Move, The Orchard's Super Dark Times, IFC's Take Every Wave: The Life of Liard Hamilton, First Pond's Window Horses and China Lion's Youth. Take a look at our box office projections for the weekend of September 22, and check back on Sunday for the top 10 estimates.